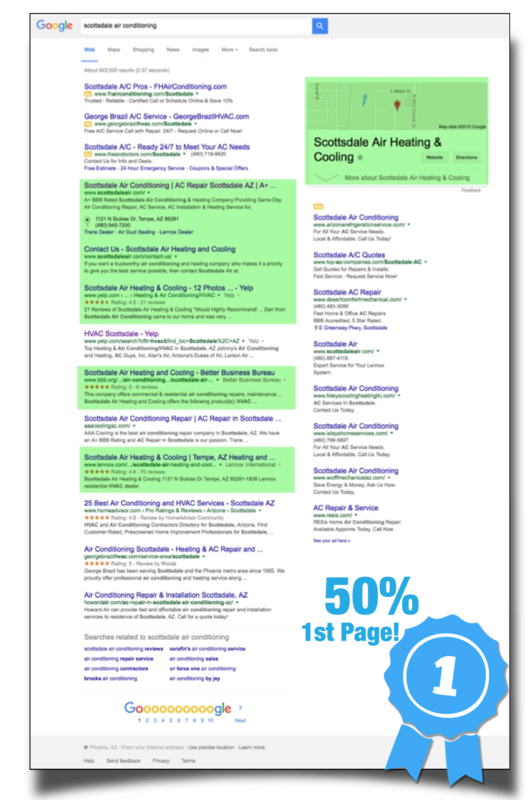 When Scottsdale Air Heating & Cooling partnered up with Online Visibility Pros, they were looking to build an Unstoppable Online Lead Generation Machine for their business that was capable of consistently attracting fresh, new, laser targeted local leads from the Internet that helped them boost their bottom line. Fast-forward a few years and our expert online lead generation team has help Scottsdale Air Heating & Cooling get to the point of being able to generate between 3-4 new customers from the Internet every single day. 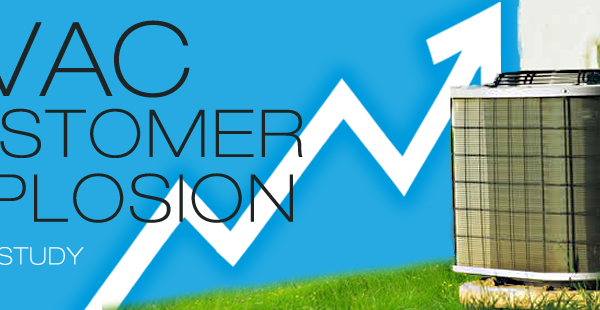 Produced over 430% increase in online lead generation efforts in first 5 months of the campaign. Integrated a turn-key customer review system to help produce consistent, high-quality customer reviews online. Marketing campaigns attracted 3 to 4 new customers every day from the Internet, far exceeding Mike’s original goals. (1) Save Time – Mike no longer had to worry about whether the time and money he’d invested in online marketing was paying off. He no longer had to research marketing techniques, labor over communication with his marketing company, or conduct time-consuming experiments to find the best marketing strategies. Instead, Mike and his team were free to focus on the most important part of their business—serving their customers—while Online Visibility Pros improved their digital footprint and kept them updated with comprehensive marketing reports. (2) Save Money – Mike received a tremendous ROI from his investment in Online Visibility Pros. He saved money by outsourcing his marketing needs: an in-house marketing expert could cost anywhere from $50-100,000 per year to achieve what Online Visibility Pros achieved at a fraction of the cost. Hiring and training employees, paying taxes on them, paying their benefits, and providing both office space and equipment is enormously expensive. Mike made the smart investment by avoiding all of those extraneous costs and choosing a partnership with Online Visibility Pros that would take his online presence to the next level and allow his business to grow for years to come. Want Results Like These In Your Service Business? Mike, the owner of Arizona-based Scottsdale Air Heating & Cooling, approached Online Visibility Pros because he was frustrated by the results of his current lead generation efforts. He had been investing for several years into SEO and Google Adwords lead generation campaigns that were built and run by big box agencies. Mike had expected much better results based on the amount of money he had invested in these campaigns. The company’s promises of high-quality traffic and leads never came to fruition and felt that his questions and needs weren’t addressed in a timely manner. So, Mike reached out to Online Visibility Pros for a more effective lead generation campaign from a company who would tailor their efforts to his industry and work with him every step of the way. Our overarching goal was to consistently attract targeted, profitable leads from the Internet. Website Development – First, Online Visibility Pros addressed the website layout and design. Our web design team focused on creating a website that would make it easy for site visitors to convert into actual leads. 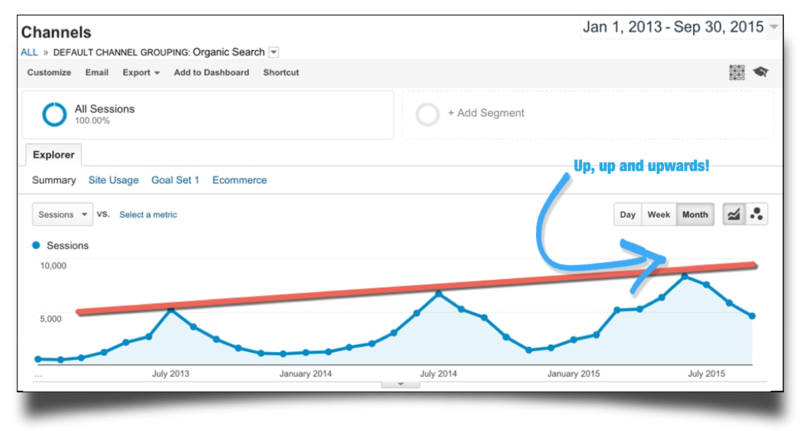 We based our updates on proven optimization methods and SEO best practices. The result was a more user-friendly, responsive design and layout specifically formulated to enhance site engagement and attract more qualified business leads. 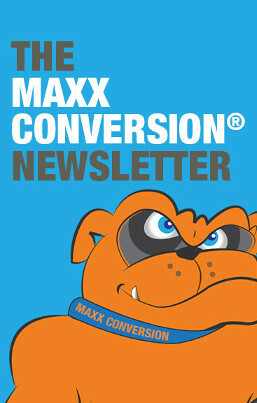 Email Marketing – Secondly, we wanted website visitors to sign up for the company’s exclusive monthly eNewsletter. Those sign-ups would convert into customers more often because they’d be nurtured with award-winning, custom-tailored eNewsletters. Social Media – Next, we got to work optimizing Scottsdale Air’s social media pages. By establishing a consistent brand and strong message on popular social media websites like Facebook, LinkedIn, Google+, and YouTube, Scottsdale Air gained immediate credibility and positioned themselves as a serious player in the Arizona HVAC market. Updating the company’s website, optimizing their social media pages, and launching a new SEO campaign produced incredible results. Their website conversion rate increased by an incredible 430%. Scottsdale Air went from 25 leads in the first month of our campaign to 145 high-quality leads by January. Impressively, these results came during the “off season” for HVAC contractors in Arizona – the fall and winter time! Highlights – The Internet marketing campaigns have turned into a very reliable lead generation tool for Scottsdale Air. They consistently attract 3 to 4 new customers per day from the Internet. These are brand-new customers likely to become long-term customers because of the incredible service provided by Scottsdale Air. Is Your Business Ready For Results Like These? or keep reading to learn how we did it. We Drove High-Quality Traffic Directly to Offers Via Laser-Targeted SEO Campaigns – This marketing strategy is responsible for driving massive amounts of leads to Scottsdale Air. How did we know these leads came from our SEO campaigns? 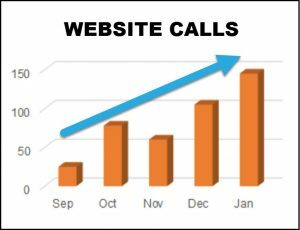 We used a trackable phone number on the website to understand how well the website generated leads over time. 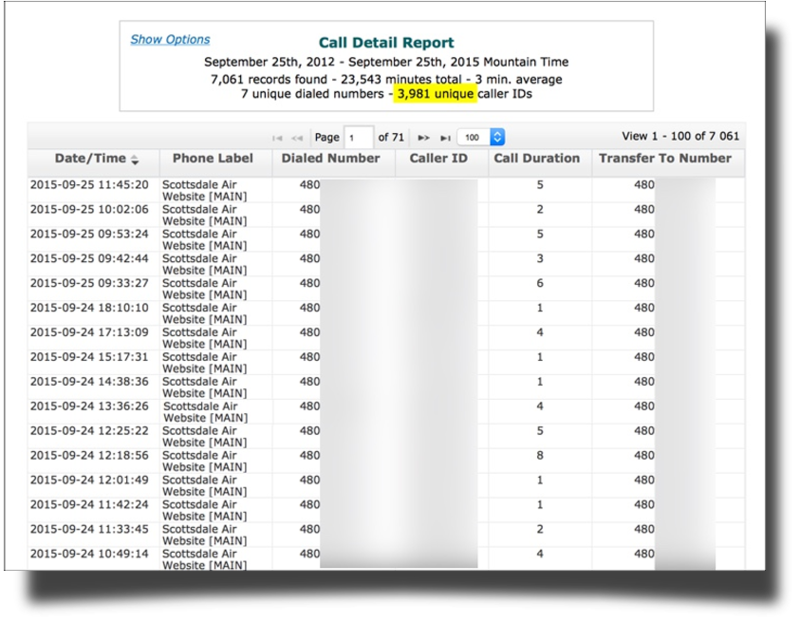 The image below shows phone calls generated from the website from September 2012 to September 2015. Scottsdale Air received a total of 3,981 unique calls averaging 3 minutes in length. Their Facebook business page and their business location. That’s OVER 50% ownership of organic results for main keywords on Google's 1st Page! Timely Website Development & Updates – Online marketing best practices have been critical to Scottsdale Air’s success online. It is critically important that your marketing team understand the ever-changing algorithms used by search engines and that they regularly update your website to maintain a high ranking. For example, our SEO experts ensured a mobile-friendly design for Scottsdale Air’s new website; if we hadn’t, their website would have ranked far lower in Google search results because Google Algorithms put so much weight on mobile-friendly websites. Search Engine Traffic Increase Brings in Even More High-Quality Leads – The screenshot below is from Scottsdale Air’s Google Analytics account. You’ll see a significant increase in the amount of search engine traffic driven to the company website from January 2013 to September 2015 by our proven SEO lead generation campaigns. This increase in targeted traffic has played a key role in helping Scottsdale Air become an undeniable authority in their local niche market online and, more importantly, attract 3 to 4 new high-quality customers a day from the Internet. Integrating a Predictable Online Customer Review System – Online reviews are becoming ever more important to a business’s overall reputation. That’s why we implemented a turn-key online review system that made requesting reviews simple for the techs and submitting reviews simple for the customers. Our online review system consistently converted 30 percent of happy customers to glowing online reviews; this boost to Scottsdale Air’s reputation was priceless and has directly impacted the company’s prospect-to-customer conversion rate. Leveraging Social Media – Staying active on social media has helped Scottsdale Air build a fence around their customers and prospects. By sharing interesting information and helpful resources targeted to their audience, Scottsdale Air continues to provide value to customers and prospects alike. In addition, when interested prospects are looking for a trustworthy HVAC company on social media, Scottsdale Air makes a strong impression by remaining available to answer questions online. A Very Successful Email Marketing Campaign – Their eNewsletter continues to generate impressive results while providing a constant means of communicating with customers and remaining top-of-mind! The campaign has a lifetime open rate of 39.2%, which means that over the course of Scottsdale Air’s 2+ year-old eNewsletter campaign, just under 40% of all recipients opened their e-mails. Almost 10% clicked on a link inside the email—that means their email list is active and likes what we’re sending them. These results are almost unheard of in the HVAC industry! When Scottsdale Air partnered up with Online Visibility Pros, they needed to build an Unstoppable Online Lead Generation Machine, capable of consistently attracting targeted, profitable leads from the Internet. Fast-forward a few years and our lead generation team has help Scottsdale Air generate a consistent flow of new, profitable customers from the Internet every single day. Integrated a turn-key online review system into the Scottsdale Air business that helped produce consistent, high-quality online reviews at a predictable 30% customer review rate. Daily social media posts that engaged followers through education, humor, and timely promotions in order to stay top-of-mind. Leveraged an award-winning monthly eNewsletter service (the Email Profit System) that generated a 39.2% open rate over a 2-year period. According to Constant Contact, the average open rate in the construction industry is 22%. Attracted on average 3 to 4 new customers every day from the Internet, far exceeding Mike’s original goals. Click Here To Learn More or Call (888) 593-0505 Today. Want UNSTOPPABLE Leads Just Like These Guys?